Fashion, fashion, and more fashion with these Eiffel tower party favors.? Enjoy the french compact and try to imagine yourself on the French Riviera.? Another idea is to enjoy your very remarkable favor and know how generous you are; how your friends will love them.? Each compact measures 3? x 2?. It's rectangular case is crafted in hard molded plastic with a textured shiny silver finish. The raised Eiffel Tower design is detailed and really pops against the textured background. It opens at a top hinge to reveal a dual glass mirror interior. 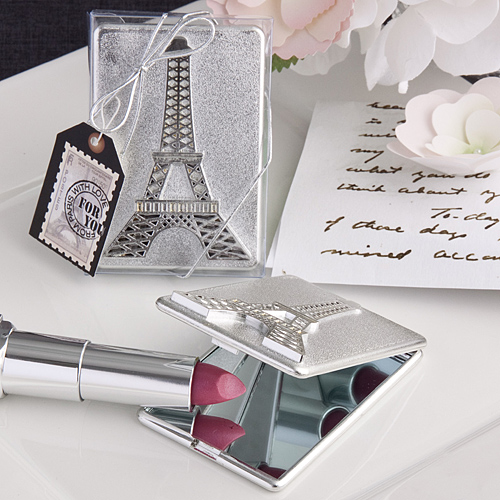 A stylish choice for Sweet Sixteen celebrations, bridal showers, Paris themes and more. Packaged in a clear display box with a metallic silver ribbon wrap and bow, there is an attached postage stamp design ?For You? tag with a ?From Paris with Love? message.